A fox has been discovered living at the top of the UK's tallest skyscraper. The animal, named Romeo by staff, is thought to have entered the 288m (945ft) Shard building at London Bridge through the central stairwell. It survived by eating scraps of food left by builders working on the incomplete structure. 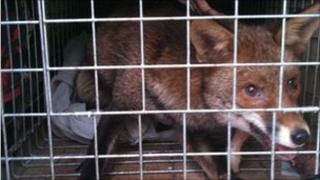 The fox was captured and taken to Riverside Animal Centre in Wallington where it was fed and given a check-up. "We think he got the message and, as we released him back on to the streets of Bermondsey shortly after midnight on Sunday, he glanced at the Shard and then trotted off in the other direction." Barrie Hargrove, cabinet member for transport, environment and recycling at Southwark Council, said: "Romeo has certainly been on a bit of a jaunt and proved rather elusive. "But I'm glad our pest control officers were able to help out. "He's obviously a resourceful little chap, but I'm sure he's glad the adventure is over and hopefully he'll steer well clear of skyscrapers in the future." The Shard overtook Canary Wharf as the UK's highest tower block last year.